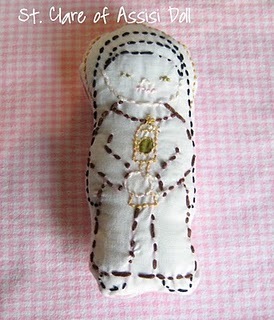 I love this little St. Clare doll made by Joyfilled Family! 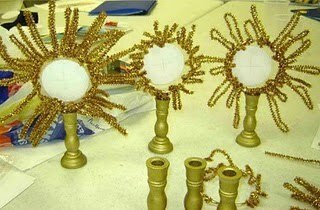 God’s Canvas, along with some other Catholic Crafts. 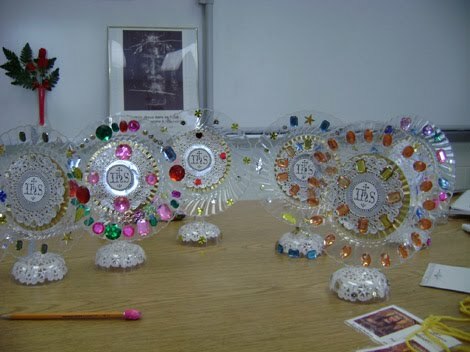 It looks like the jeweled Monstrance is a clear plastic plate with either a plastic bowl or a margarita glass, doilies and sticky gems – Made one similar to this a couple years ago only anchored it to a flower pick and stuck it in a clear vase with marbles. Yes, but how do we attach the clear plastic plate to the upside down clear glass? I think you need to cut off the base and just leave the stem of the upside down plastic wine glass and then glue the stem to the back center of the plate….